Halloween kinda sorta changed my life forever for the worst. 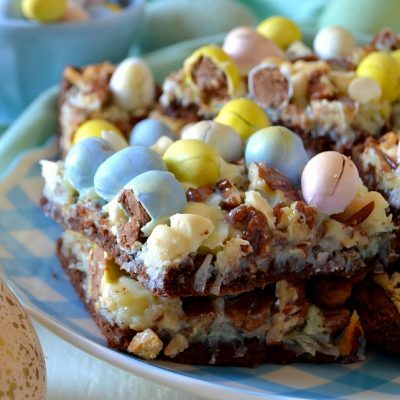 I was reacquainted with… Butterfingers. I’ve somehow managed to successfully avoid these crispy, wafery, peanut buttery candy confections for years, or at least since Simpsons released Butterfinger BB’s with Nestle and I ate box upon box at the movie theaters as a kid. For some reason, some day long, long ago, I stopped my addiction and moved onto other things, like chips and Real Housewives of Beverly Hills and Betseyville handbags (really… that addiction was an expensive and dangerous one, but I’ve since cut back to 12 purses). I don’t know what possessed me to rip open an orange package and take a bite, but I did, and now I’m re-obsessed with this damn candy bar. 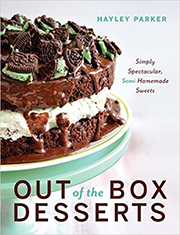 Obviously this goes against my entire diet/healthy living lifestyle… oh, hell, who am I kidding? Now Butterfingers are only competing calorie-wise with frou frou coffee drinks (helloooo, Starbucks just launched their holiday drinks!! Who else is stoked for gingerbread chais?!) and colby Cheezits. I mean, this entire post may as well be a disclaimer to my sweet boyfriend that, by January, I will most likely be 20 pounds overweight due to stuffing my face senselessly with holiday-related treats and calories. I’ve officially lost my willpower to anything Christmas flavored, and I’m partial to chips and dips, especially when they involve copious amounts of sour cream and/or cream cheese. The artichokes and/or spinach, as far as I’m concerned, are merely sprinkles for an unhealthy heap of dairy for me to dip my greasy potato chip into. YUM. Anyways, with the dwindling leftover Halloween candy providing a bleak reminder of how many calories we’ve consumed since Monday, I decided to take advantage of the handful of remaining Butterfingers I’ve hoarded and make something delicious with them, which was a brilliant idea on one hand, but also another means for inhaling more candy bars on the other hand. Life can’t always be easy. 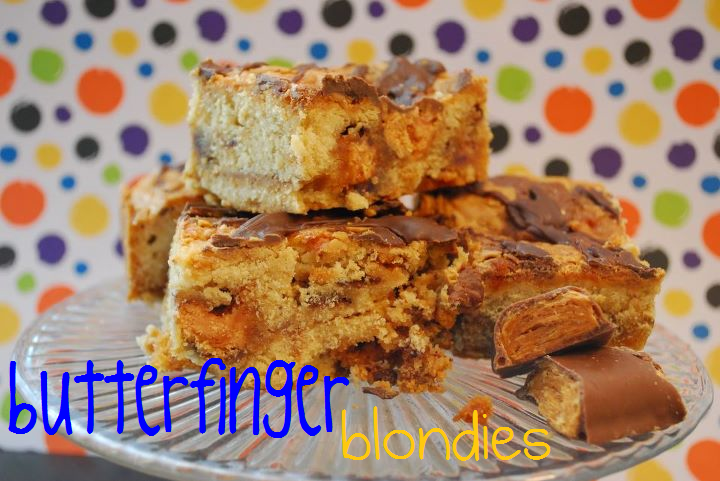 I threw some chopped Butterfingers into a simple blondie batter, and therefore, signed my life away to this concoction. 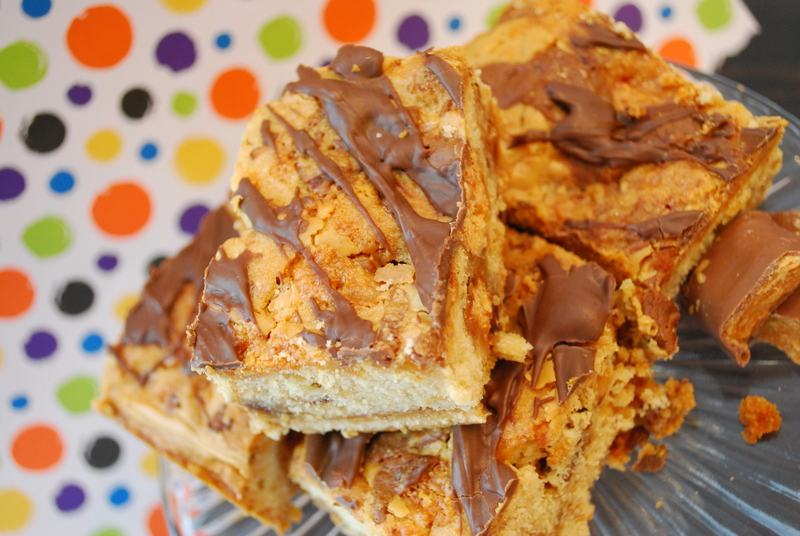 It’s buttery, rich, sweet and delicious, and a genius way to incorporate Butterfingers into blondies, another one of my favorite addictions. Isn’t it irritating how smart I am? 1. Preheat oven to 325 degrees F. Lightly grease an 8×8 inch pan with cooking spray. 2. In a large bowl, beat together the butter and brown sugar until creamy, about 1 minute. Beat in egg and vanilla until blended. Gradually add in flour and the salt, about 1 cup at a time until a thick batter forms. 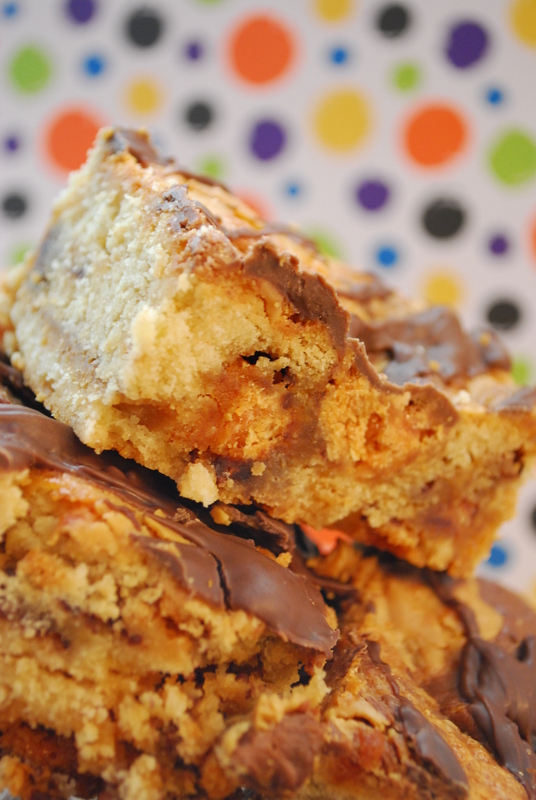 Stir in chopped Butterfinger candies. 3. Pour half of the Butterfinger batter into your greased pan, spreading around to cover. Drizzle half of the melty peanut butter on top of the batter in the pan. Pour the remaining blondie batter on top, spread it around, and drizzle the remaining melty peanut butter on top. Bake for about 40 minutes or until a toothpick inserted in the center comes out clean. Cool in the pan completely. 4. Once blondies are cool, microwave your chocolate square for 30 secs, stirring after, and continue to nuke in 30 second intervals until it’s melted. Drizzle over the top and let sit, about 10 mins to harden. Cut into squares and store airtight. 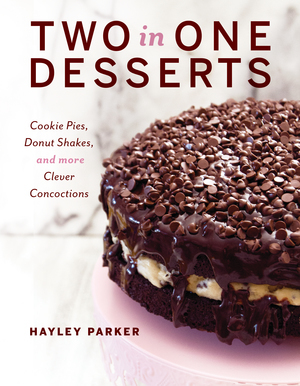 I’m pretty much gaga over the sweet and salty peanut butter, the rich blondies and the drizzle of the yummy chocolate and am fairly positive I’ll suffer withdrawls when they’re finished off. Make these and tell me how you like them!